Les Petersen sends a photograph of an unhappy third instar caterpillar of a Large Yellow Underwing Moth Noctua pronuba, seen on January 12 at Cedar Hill Golf Course. Jeremy Tatum writes: Sonia Voicescu, who has contributed a number of observations and photographs to this site, has carried out an excellent study of the Ringlet Coenonympha tullia at Rithet’s Bog. I am going to test my primitive computer skills to the limit by attempting to attach her Report and its Appendix to this Invert Alert posting. I don’t guarantee it will work. Several regular contributors to this site sent Sonia some butterfly photographs from Rithet’s Bog. You will find these photographs in the Appendix. So far I haven’t had any response to my January 6 appeal for someone to send local butterfly observations to eButterfly. Jeremy Tatum writes: Sher Falls sends a photograph of an insect from Nanaimo in the summer of 2017. While we usually show pictures of recently-photographed invertebrates, we’ll show this one, partly to keep Invert Alert going during the winter months, but also because it is an interesting insect, and to teach me a lesson. When I first saw the photograph, I took a quick glance at the narrow, constricted abdomen and confidently declared it to be a hymenopteran of the Family Ichneumonidae. Beware of people who confidently identify an insect after a brief glance! It is not a hymenopteran at all – it is a fly! It is a dipteran of the Family Conopidae. My book by Colyer and Hammond with the unlikely title of British Flies says that conopids “often bear a striking resemblance to solitary wasps and other hymenoptera”. Well, I shan’t use that as an excuse, although the insect does do quite a good job of deception. 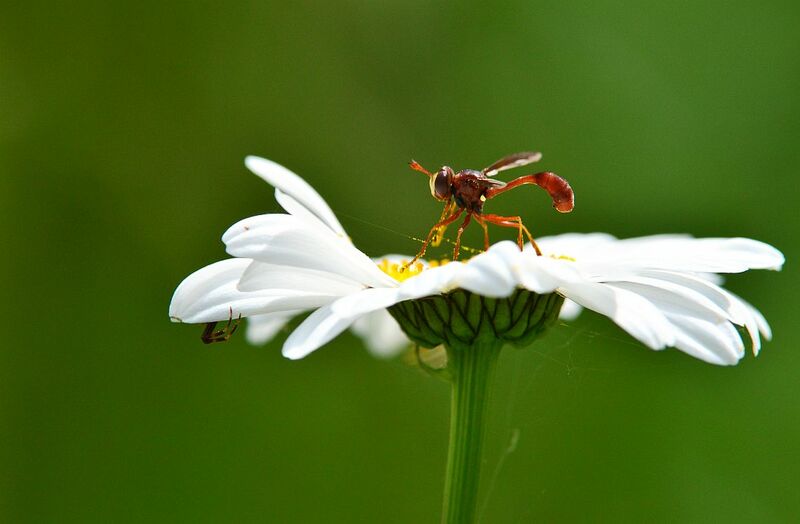 We don’t know if the fly is aware of the spider lurking under the flower. You can guess the rest of the gist of the article, or read it in the VN. In any case I wonder if anyone is contributing observations to eButterfly from our area, or if anyone would like to undertake to do so. Not me, because I’m a computerphobe, but I’m sure that, among our viewers, there are some who are already familiar with eBird, and who could relatively easily handle eButterfly. Collectively we are pretty familiar with the butterflies of this area, but are our butterflies more widely known? If anyone would like to investigate eButterfly and to contribute local butterfly observations to eButterfly, please let us know. We have some butterflies that are regular, but which fly at different times of year. Some are single-brooded; others are double-brooded. 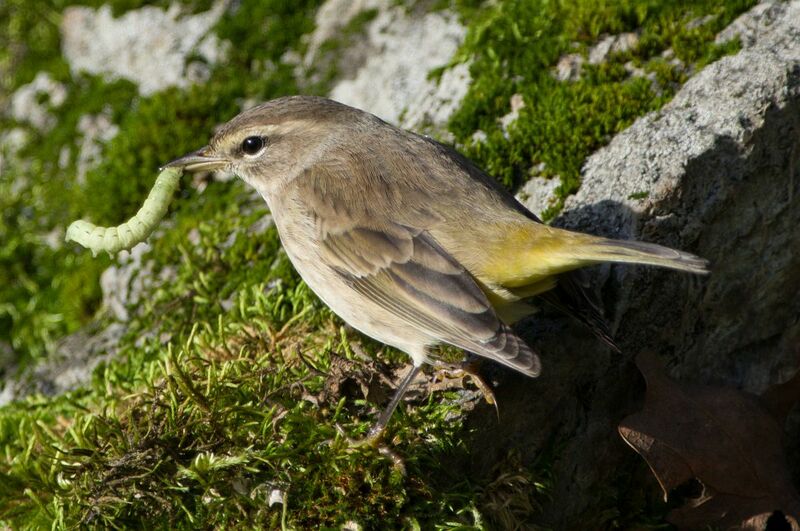 There are some, including migratory species, whose numbers vary greatly from year to year (e.g. Mourning Cloak). There are some whose numbers seem to be declining drastically (Satyr Comma, Anise Swallowtail, Mylitta Crescent). I can’t offhand think of any whose population is increasing. There are occasional stray rarities (e.g. Monarch). And new discoveries (Johnson’s Hairstreak). Thus there are lots of things that we are familiar with, but which should be reported and which ought to be entered into the national body of butterfly knowledge. So, if anyone is interested in reporting our observations to eButterfly, let us know!